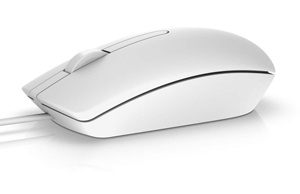 The Dell Optical Mouse – MS116 features optical LED tracking and wired connectivity providing a stellar performance day after day. Improve your productivity at the office or at home–the Dell Optical Mouse will help keep you on task with accurate 1000 DPI optical tracking. Designed for comfortable use over extended periods of time, the Dell Optical Mouse is your desktop partner. Shaped and sized to fit the contours of your hand with 2 buttons and a scroll wheel, the Dell Optical Mouse makes it easy to navigate through on–screen projects. Simply plug the Dell Optical Mouse into any available USB port and get to work–it's that easy. The Dell Optical Mouse is the perfect choice for either home or office use–wherever reliability, comfort and convenience are objectives. With a contemporary design aesthetic, the Dell Optical Mouse–MS116 seamlessly fits into any desktop environment. Vienkārša, bet ērta un viegla. Labi darbojas uz parastas galda virsmas.